Brief: APMG International is an examinations board for business qualifications including ITIL and Prince2 project management exams. The initial brief was to listen to internet conversations already taking place and engage with the project management community and candidates taking professional qualifications. The brief has developed to add engagement with the Project Management community and building the profile of APMG International with the specific aim of increasing the number of subscribers to the blog and followers on Twitter. Delivery: We launched a blog for APMG on the subject of learning trends for professional managers offering news, interviews and updates on their qualifications. We also set up and managed a Twitter campaign. Three years later, APMG International is the most visible and interactive examinations board in the PM world, dominating the online space and engaging daily with friends, followers, examiners and candidates. 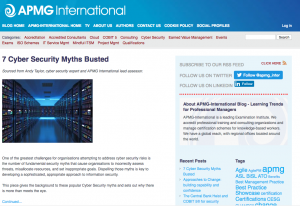 Currently @APMG_Inter has over 2500 Twitter followers and over 2000 subscribers to the blog. We have now extended our service and run online webinar sessions for the client, training staff members around the world on Social Media strategy and implementation.